SAN FRANCISCO (AP) — The head covering is among the most identifiable elements of Muslim women’s dress and most likely to be portrayed as drab and restrictive to the Western eye. But a new exhibition in San Francisco shows that the covering used by some Muslim women can be a bright yellow head wrap or a loose drape of rose; a black silk and lace scarf by Dolce & Gabbana; or a hood attached to a knee-length dress. “Contemporary Muslim Fashions” opens Saturday at the de Young Museum with about 80 ensembles by nearly 60 designers from around the world, including the Middle East and Southeast Asia. The clothes are vibrant, elegant and playful, ranging from high-end couture to sassy streetwear. The people behind the installation, which is the first major museum exhibition of its kind, hope to spark a deeper understanding of the women who are part of the second-largest religion in the world. 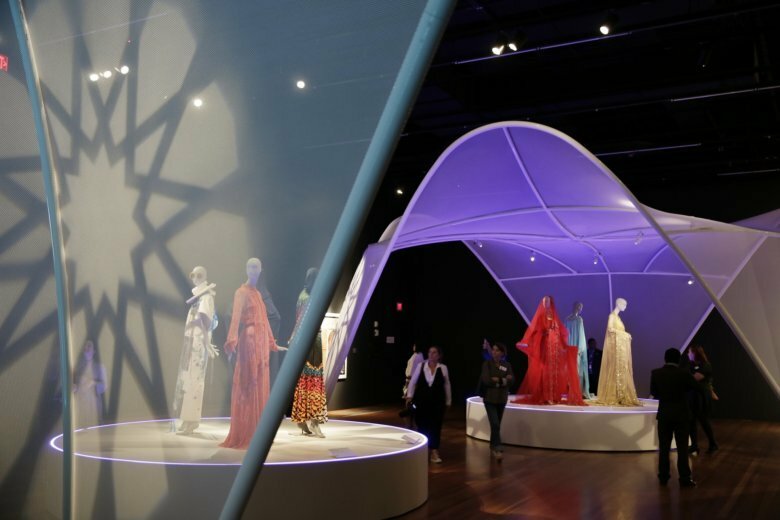 “At a time when Muslim women are being increasingly targeted for using their fashion choices to assert their independence and identity, we hope that this exhibition will allow a positive review and examination of a community that’s often talked about, but rarely given the chance to speak and present itself,” said Gisue Hariri, one of two Iranian-born sisters whose architecture firm designed the galleries. The exhibit comes amid conflicts in Western countries over Muslim clothing. Denmark recently banned face veils in public, saying the move was critical to ensure public safety and uphold Danish values. Austria, Belgium and France have similar laws. In the U.S., President Donald Trump issued a ban on travel from several majority-Muslim countries. But the idea for the exhibition predated Trump’s election, said Jill D’Alessandro, curator in charge of costume and textile arts for the Fine Arts Museums of San Francisco, which includes the de Young Museum. She said the seed was planted in 2016, when France was in an uproar over a ban on “burkini” swimsuits worn by some Muslim beachgoers. At the same time, D’Alessandro was seeing examples of chic “modest fashion” embraced by young Muslim women who wanted to express their religious piety. Modest fashion has become a $44 billion industry, with more Western fashion houses catering to Muslim consumers. Last year, Nike introduced a headscarf made of high-tech fabrics. A Max Mara fashion show in 2017 featured a model in a hijab, her body wrapped in one of the company’s long tailored coats — a common look among wealthier Muslim shoppers. The Institute for Social Policy and Understanding, an organization that studies American Muslims, released a poll that showed most women said they wear a hijab for religious reasons. Only 1 percent said they were required to do so by family. Dalia Mogahed, the institute’s research director, is delighted the de Young has taken on the topic. Mogahed, who is not affiliated with the show, balks at governments that force Muslim women to cover themselves in a certain way and those that won’t let women cover up as they wish. “The perception that people have of Muslims in America or Muslims globally is often shaped by sensational headlines that ignore and minimize what the majority is all about,” she said. Designers featured hail from Saudi Arabia, Turkey, Malaysia, Singapore, Iran and other countries. One of D’Alessandro’s treasured finds is a 2012 “Hoody Dress” by British designer Sarah Elenany. She created long-sleeve, knee-length dresses for the Scout Association in the United Kingdom so Muslim girls could rappel and climb comfortably. The dresses were worn over trousers or leggings. Also among the pieces is a traditional Pakistani wedding ensemble of red silk and chiffon, with metallic embroidery and glass beads. It is on loan from Saba Ali, a San Francisco-area stylist who served as adviser to the exhibition and styled the head coverings. She is thrilled to be part of the show, which ends in January and then moves to Frankfurt’s Museum Angewandte Kunst.